Today the infamous Starbucks drink Pumpkin Spice Latte comes out. In the past, it has always come out in late September. I’m not surprised by this because I saw Halloween outfits in the stores back in July. Our world is changing and holidays are being celebrated earlier and earlier due to our lack of patience and stores capitalizing on early profits. Black Friday is now on Thursday. Christmas is being celebrated before Thanksgiving. Even though Fall is my favorite time of year, I personally want to enjoy my last month of summer before I settle into Autumn season (pus it’s still too hot!). PSL has become so popular that it even has its own Twitter page. But what has been interesting this year is this posting below by the Food Babe. 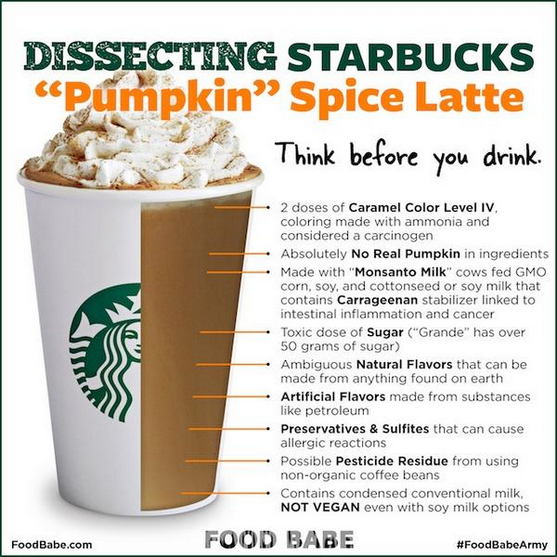 Starbucks has always been hesitant to post the ingredients to PSL because it has no actual real pumpkin in it. This will probably bode well for smaller independent coffee houses that use real ingredients in their pumpkin drinks if word continues to spread about this. I’m curious to how Starbucks responds to this. What do you think or do you care? Every year after Thanksgiving I have all this turkey left over. This year was no different. So I always try and come up with something creative to make with it. Last year it was turkey pot pie. This year – turkey sliders. I stacked turkey, stuffing, cranberry and gravy on some dinner rolls to make these awesome little goodies. It made for lunch at work every night this week. I love cooking on Thanksgiving. I’ll have the Macy’s parade on in the background followed by some football games while I cook. It’s fun to plan and organize all the ingredients and what to cook first so that everything comes out hot. I just love how cheap all the food is at this time of year. Best advice I heard is to take your list of sides and cut it in half (I have a tendency to make too much). This year I had the honor to cook for several people without family, so I bought an almost 25 lbs turkey. This year I brined my turkey with a killer blend from World Market. Some of the sides I made were a green bean casserole, sausage stuffing, deviled eggs and pumpkin pie. I’m thankful my turkey came out great! We had over fifty people show up for our Thanksgiving dinner. It was a blessing to serve them and eat and fellowship with them. I saddens me that Thanksgiving gets overlooked because it is such a wonderful holiday. I love spending time with friends and family in community over food. I love it when the weather starts cooling off. For me, autumn means layers of clothes, chili and bonfires. Tonight we had a fun fellowship night of corn hole, s’mores and music. I’m very blessed to have a great group of friends to do life with and thankful for moments like this to be in community. Tonight got me excited for the upcoming holidays. Día de los Muertos (Day of the Dead) is a Mexican holiday that is celebrated throughout Mexico and other parts of the world. It is a day for friends and families to remember those that have died. It takes place November 1 and 2. Some traditions include building private altars honoring the deceased using sugar skulls, marigolds, and the favorite foods and beverages of the departed and visiting graves with these as gifts. There are also parades and festivals that end at cemeteries in which families pray for the deceased. 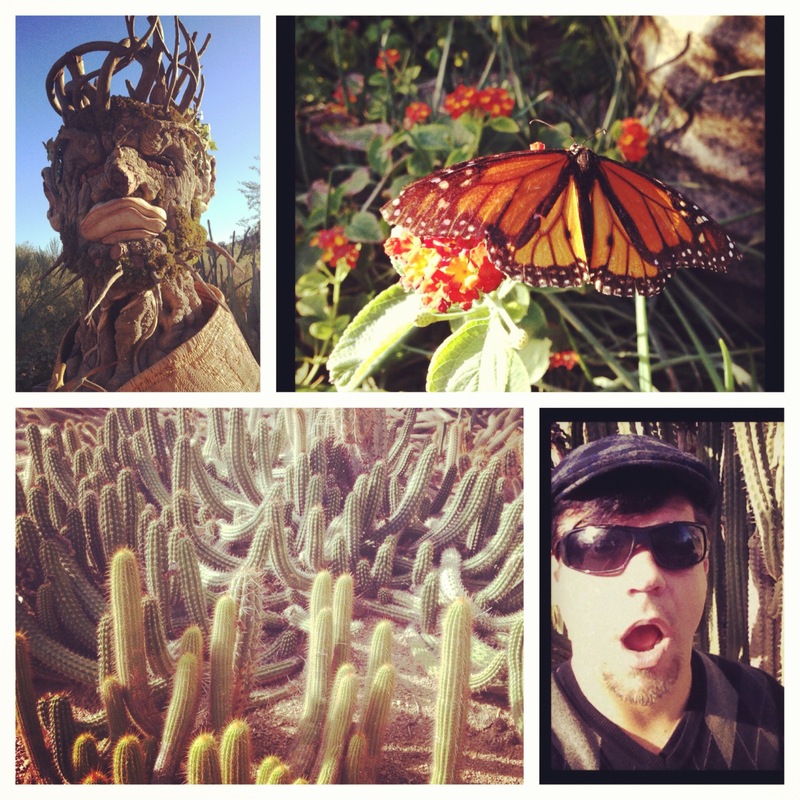 Desert Botanical Garden honors this holiday with festivities and music. Also on display was Philip Haas’ The Four Seasons – four giant monumental sculptures. Each season is represented by each of the imaginative portraits composed of fruits, vegetables, flowers and related objects. I had a blast hanging out with my son on Halloween. I was a pirate and he was some sort of a dark Jedi (I think… haha). Anyway.. we cruised around town and then stopped by our friends the Durben’s. Their neighborhood is full of activity as kids all over the place go trick or treating. It’s was a chance for us to bless the community as we gave out a ton of candy. We also had a fun time together eating good food and enjoying each other’s company.